Happy Family Hostel is owned by Mr. John Lee who has more than 25 years experience running hostels in Taipei. It is situated within a short walking distance (less than 5 minutes) from Taipei Train Station. It is possible to get to different parts of the city and country for activities or sightseeing using the various public transports near the hostel. 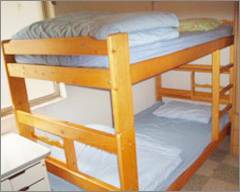 The hostel has a range of rooms catering to different requirements. In addition, there are many common areas for general use as well as useful facilities available to make things as convenient as possible. There are dormitories, single, double, twin, and triple rooms. Most of the rooms have air-conditioning for added comfort. Although there are no individual bathrooms with each of the rooms, there are many bathrooms available for people to use. The many free facilities in the hostels include: PC with internet access, wireless internet access, washing machine, cable TV, refrigerator, common rooms, hot shower, and drinking water. The atmosphere is friendly with people helping and sharing their experiences, with John, the owner, leading by example. John has traveled to many parts of the world, experiencing many different cultures. He is happy to share his experience and help to ensure you have an enjoyable stay in Taiwan. 1. Get off the KuoKuang airport bus at Taipei Train Station. This is the East side of the station. 2. Get in the bus station going out from other entry door, right turn to walk(civil boulevard) about 3 mins(first intersection) then left turn cross the under free way. 3. Lane 56 is just before the Family Mart convenient store at the North West corner of Civic Boulevard and ZhongShan North Road. 4. Walk about 10m on Lane 56 then take the small right-hand lane and the hostel is the first building on the left. 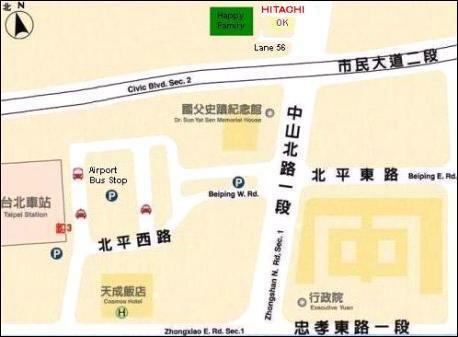 Less than 5 minutes walk from Taipei Train Station and MRT stations (subway/metro). Bus terminal to airport and other cities less than 10 minutes walk.